1. A five- to fifteen-minute classroom conversation around purposefully crafted problems that are solved mentally. 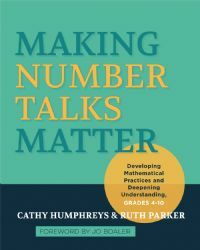 • How to develop fractional reasoning and strategies for operating with fractions, decimals, and percentages. The online video clips provide a visual platform for teachers to reflect on their current practices and target essential understandings from their readings. The video clips feature number talks filmed in actual classrooms grades 3–6. Clips range from one to ten minutes in length with a total viewing time of approximately two hours. The resource includes reference tables to help you quickly and easily locate the video clips by chapter and grade level.